Feature for feature, the iPad mini mainly bests its rivals in the 7-inch tablet market, but it does so at a price that’s 65 percent higher than those competitors. The mini has a larger display than Amazon’s Kindle Fire HD and Google’s Nexus 7. Its screen measures 7.9 inches diagonally, while the Fire and Nexus have 7-inch displays. Apple’s tablet is longer than both its competitors and wider than Google’s slate, but in the important category of thinness, the mini is a svelte 0.28 inches, compared with 0.41 inches for the Nexus and 0.40 inches for the Fire. Not only is the mini slimmer than its opposition, but it’s lighter, too. It weighs 11.01 ounces, while the Nexus weighs 13.40 ounces and the Fire, 13.93 ounces. However, both the Fire and Nexus have higher-resolution displays than the mini. 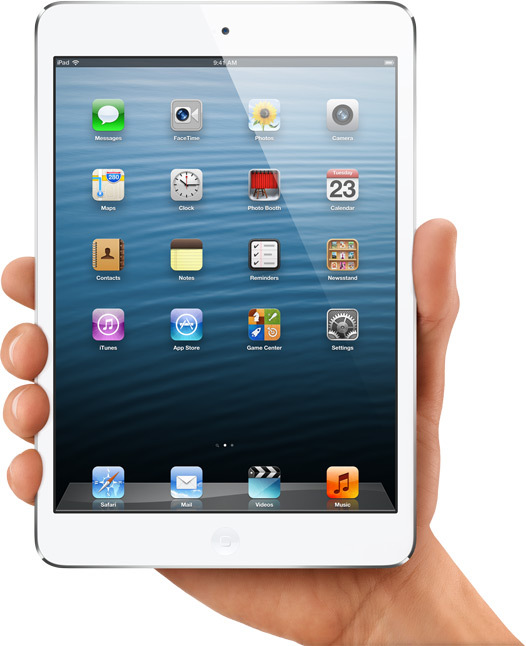 The Amazon and Google tablets have screens with resolutions of 1280×800 pixels, while Apple’s slate has 1024×768 pixels. Moreover, the Nexus display has a density of 216 pixels per inch, compared with the mini’s 163 ppi. The Fire’s also has a polarizing filter and anti-glare technology, which neither of its rivals have. Both the Fire and the Nexus edge out the mini in the processor speed department. The A5 processor in the mini runs at an estimated 1GHz, while the Nexus has a Nvidia Tegra 3 quad core chip running at 1.3GHz and the Fire has a TI OMAP4 4460 running at 1.2GHz. Apple offers a wider variety of storage options with its tablet — 16, 32 and 64 GB — compared with 16 and 32 GB for the Fire and 8 and 16 GB for the Nexus. All the 7-inch tablets have long-lasting batteries. The mini will run for 10 hours on a charge; the Nexus, nine hours; and the Fire, 11 hours. The mini has twice the camera power of its competitors, with a 1.2-megapixel front-facing and 5-megapixel rear-facing camera. The Nexus only has a 1.2-megapixel front-facing camera and the Fire an HD front-facing camera. The Fire, however, beats both its competitors in the sound department. It has dual-driver stereo speakers with Dolby Digital Plus, while the Apple and Google slates have only have mono sound. A full array of wireless options are available in by the iPad mini — WiFi 802.11 a/b/g/n, cellular and 4G LTE — while its competitors only support WiFi. One of the biggest differences between the mini and its rivals is its price tag. Its base price is US$329, compared with $199 for basic units of the Fire and Nexus 7. “It is arguably the best 7-inch product in market,” said Rob Enderle, principal analyst at the Enderle Group. 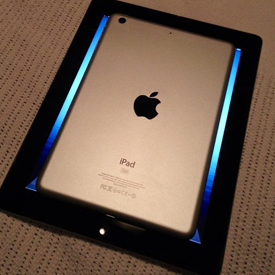 “I think it could command as much as a 25 percent premium over other tablets like the Kindle Fire HD and Nexus 7. The problem is, it is priced 60 percent higher,” he told MacNewsWorld. “I can’t justify this premium,” he added. “I think this will be a very difficult product to move particularly in a market where cash remains very tight and at a time when folks are buying gifts for others,” he added. Consumers will be the ultimate judge as to whether Apple is charging too much for the product, maintained Forrester Research analyst Sarah Rotman Epps. “In my view, Apple would be leaving money on the table if it met the competitors’ price points because consumers have shown that they’re willing to pay more for Apple products and the hardware is a higher quality than its competitors’,” she told MacNewsWorld. Apple has shown that the way its products are designed and built attracts customers to it, asserted Ben Bajarin, principal at Creative Strategies. “There is something to the build quality of a product that will be valued by big chunks of the market,” he told MacNewsWorld. In addition, the hundreds of thousands of apps made for the iPad make it a premium product, he argued. “Consumers will be asking themselves, ‘Do I want to spend this much less on a device that really isn’t the best experience in terms of software volume or am I willing to spend up and get what is arguably the best software experience on a tablet?’” he observed.